Amy Chastain has made a lot of enemies—none so ruthless as the insanely powerful New Ruling Order (NRO). When they killed her husband, it was hell. Then they targeted her children by injecting them with a dangerous, experimental isotope. Now Amy trusts only one man to help her: the ex-commander of SEAL Team 7. In the company of Navy SEALs, Jace “Mac” Mackenzie was in his physical element. Now he’s on the run from the same cabal that poisoned Amy’s children. That doesn’t stop him from launching a mission to bring down the NRO—and find an antidote. But the clock is ticking. And as the sparks fly between him and Amy, Mac realizes he has more to lose than ever before. As Mac closes in on the NRO, he uncovers a plot that threatens more than Amy’s children. Now it’s a race against time to stop a global conspiracy, save the woman he loves, and protect the family that’s starting to feel like his. 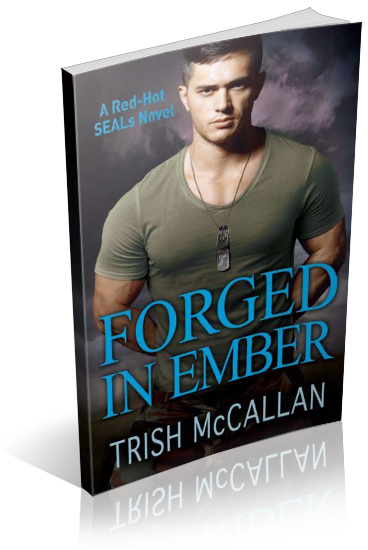 I am organizing a release week blitz for Forged in Ember by Trish McCallan, an Adult Romantic Suspense novel. The blitz will run from May 14th to May 20th, 2018, you can post on any day during this window. There will be excerpts available for your post, and every participant will be able to post the blitz-wide giveaway if you wish – giveaway prize(s) courtesy of author. Social media sites are welcome. An email with the complete post info including promo items and giveaway details will be sent to all participants on May 11th.